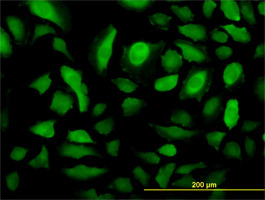 Mouse anti Human RRM2 antibody, clone 1E1 recognizes human Ribonucleoside-diphosphate reductase subunit M2, also known as RRM2 or Ribonucleotide reductase small subunit. RRM2 is a 389 amino acid ~ 45 kDa intracellular antigen involved in the synthesis of precursors required for DNA synthesis (UniProt: P31350). Mouse anti Human RRM2 antibody, clone 1E1 has been used for the detection of RRM2 in human bladder cancer cell lines by western blotting (Kerr et al. 2014). 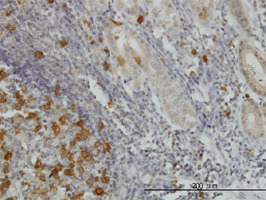 Recombinant protein corresponding to aa 1 - 111 of human RRM2. Tang, L. Y. et al. (2007) Quantitative phosphoproteome profiling of Wnt3a-mediated signaling network: indicating the involvement of ribonucleoside-diphosphate reductase M2 subunit phosphorylation at residue serine 20 in canonical Wnt signal transduction. Mol Cell Proteomics. 6: 1952-67. Kerr, M. et al. (2014) Deoxycytidine kinase expression underpins response to gemcitabine in bladder cancer. Clin Cancer Res. 20 (21): 5435-45.